Thanksgiving snuck up on me this year! I had an amazing weekend away with my Primal Potential Masters Club and then raced back to spend 4 days in the studio recording the audiobook version of my first book! When I emerged from the cave, Thanksgiving was just a few days away! 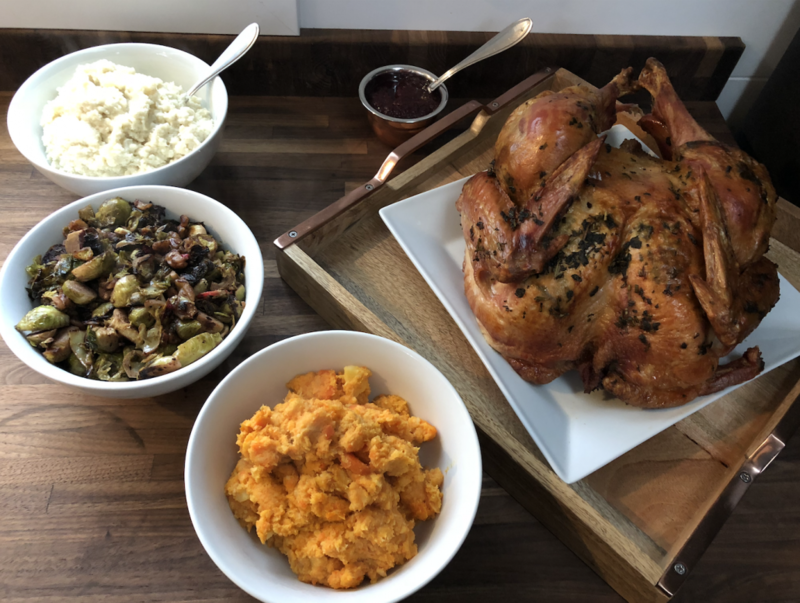 My boyfriend has to work on Thanksgiving and my family is having Thanksgiving catered, so I decided to have a Thanksgiving meal a few days early with my friend Sarah (the Seasouled creative genius) and my boyfriend. What will I LOVE and look forward to eating? What can I make that will leave me feeling really great and amazing AFTER the meal? What will I enjoy as leftovers? What’s going to prevent the need for $150 in ingredients I don’t have and won’t use again? I also think through what things won’t leave me feeling my best. Sure, I love fresh-made rolls and cornbread, but I don’t love how I feel after I eat them. I love mashed potatoes, stuffing and pie but I don’t love how I feel after I eat them. I think about a meal in terms of what I’ll love and that has to take into account both pleasure during the meal and happiness afterwards. I got my turkey from Butcher Box because their standards for meat are sky high. Antiobitic and hormone free – sign me up! 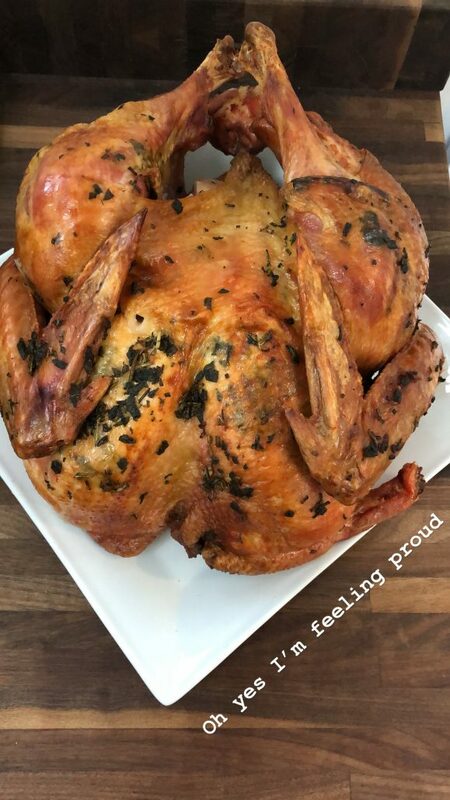 I think this is only my 2nd time making a turkey and I followed a simple recipe from Nom Nom Paleo for a butterflied bird. One of my favorite holiday meals is one my stepdad used to make: mashed carrots & parsnips with nutmeg. It might sound weird, but the sweetness of the carrots and the natural spice of the parsnips pair perfectly together! Plus, they mash so easily! It’s a silky, satisfying side dish that leaves me praying for lots of leftovers! PLUS!!! I can make this a day ahead of time! Stress reduction for the win! I will take any opportunity to eat brussels sprouts. I LOVE them. They key is to buy them FRESH, not frozen. There are some veggies that do well after freezing but brussels sprouts aren’t one of them. Though I don’t have a recipe for you, I’ll tell you how I made my brussels. I bought them on the stalk, though fresh in a bag will work, too. Chop off the end, cut in half and remove the loose leaves. Make 4 strips of bacon and reserve the bacon fat in the pan. Remove bacon, set aside, and add brussels to the pan with bacon reserves. Cook over medium heat until browned to your preference, stirring frequently. Add a handful of cranberries and a handful of walnuts. Remove from heat, top with crumbled bacon. Lastly, I wanted a cauliflower mash. I roasted a bulb of garlic by wrapping it in foil and tossing it in the oven until it softened. Into my Vitamix blender I added 2 lbs of cauliflower, some roasted garlic, cream, butter, salt and pepper. That’s all! This is a meal that will be absolutely delicious, it’s pretty simple to make, affordable AND will leave me feeling really wonderful afterwards! How about you? What’s on the Thanksgiving menu?